In the span of time it took me to shower this past Sunday morning, my children erected a village of paper plates, red Solo cups, strips of paper, and Elmer's glue on our kitchen table. The village had distinct rooms, walkways, and an elevator system. By the time my hair was dry, my children had scripted a backstory for the small plastic figurines who populated the scene. It's the same kitchen table that's marred with scratches from years of use, Sharpie marker scribbles from the four year old, and a piece of Scotch tape that's become one with the tabletop and remains affixed no matter how often I scratch at it with my fingernail. This particular day the table also was crusted with Play-Doh and a dried white streak that, when in its more viscous state, had probably been yogurt. My family ate lunch after church around this very table, our plates and cups precariously close to the edges so we didn't crowd and collapse the village which, according to my children, was ready for expansion. I won't miss this. I really won't miss this -- not a table that looks like this, not the urban sprawl of plastic cups and paper plates, not this mess that spontaneously crops up every single day. When I'm confronted with these honest thoughts as a mother, it somehow seems wrong. Shouldn't I be thinking about the benefit of creative expression? Savoring these brief years of imaginative play? Shouldn't I be putting my kids before my desire to eat lunch on a clean kitchen table? But, to be perfectly honest, there are days when I just want a clean table. Like me, whether you've consciously articulated it or not, perhaps you don't think that good moms should feel like this about their offspring and their kitchen tables. Good moms shouldn't dislike byproducts of motherhood. Good moms should be able to take their kids' childhoods in stride. These are troubling thoughts, especially when you are feeling this way, and you do dislike the messy kitchen table, and you aren't exactly taking things in stride. Guilt and shame well up, muffling any inclination to acknowledge these matters, and you don't say a thing. You just beat yourself up a bit internally. This is precisely why I'm writing this post. I'm hardwired to assume that I shouldn't ever think or feel this way. But sometimes I do. I don't think I'm alone. When we wrestle with parenting silently and privately, it's easy to become tangled in the warped thinking that if we don't savor or appreciate every detail of motherhood then we must not sufficiently love our kids. If we loved them enough, after all, sequential years of noise, mess, and tiredness wouldn't grate at us. If we were better at mothering, we wouldn't feel moments of relief when our kids headed off to school. If we were truly selfless, as mothers ought to be, we'd stop experiencing the desire to have our own lives. I love my children. I also want a clean kitchen table. These aren't mutually exclusive sentences. Wanting a clean kitchen table doesn't negate the love I have for my children. We shouldn't confuse our children with motherhood. We can love our kids daily without loving all aspects of motherhood daily. I can consider my children the most important beings in my world besides God and my husband, and still want a break from them. I can revere motherhood as sacred and holy and fulfilling, while simultaneously recognizing that there's a call on my life that partially will be answered outside the walls of my home, separate from a direct connection with my three children's individual lives. Fellow moms, today if you want an entire night's sleep, or a small purse instead of a diaper bag, or a lacy bra instead of a breast pump, or an uninterrupted afternoon to read or sleep or walk through Target without nearing the toy department, or a bathroom sink that isn't streaked with globs of semi-gelatinous toothpaste, or a thriving career or ministry that requires you to periodically leave your children so you can invest in yourself and others, you are not alone. And you are not a bad mother. Love how you distinguish how there's a difference between loving our kids and loving motherhood. They really are two different things but I don't think we think of it that way. As you said when we feel that we dislike an aspect of motherhood then that must mean dislike or not love our children. Great post. 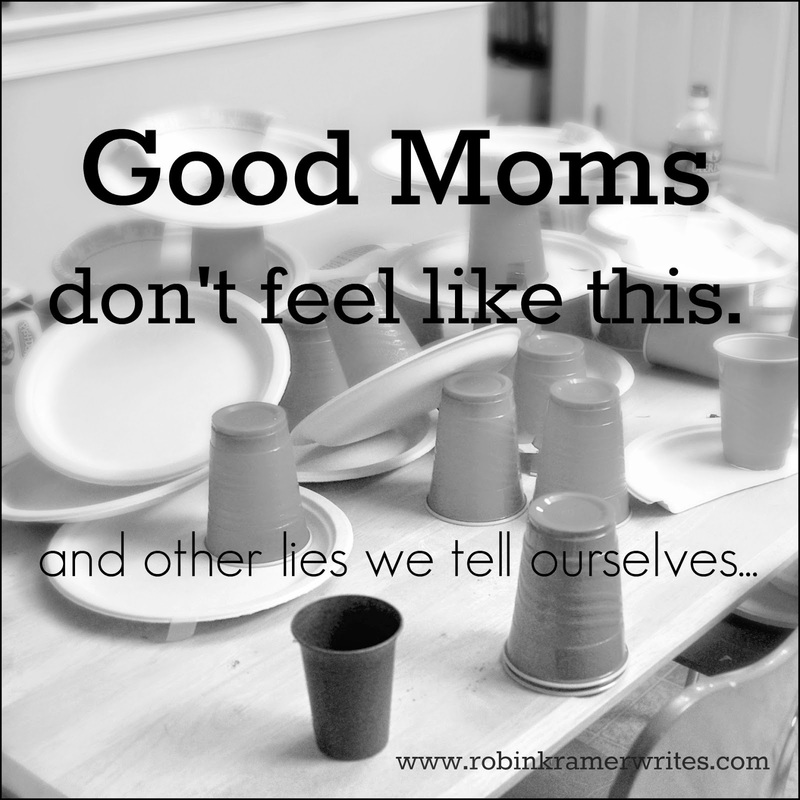 Oh Robin this is simply divine and every mom needs to read this. I have those moments where I judge my thoughts and think I'm a bad mom because I'm not on board with something that they're doing. I, too, want a clean kitchen table and to be able to walk through the basement without stepping on a toy. Such a fabulous post. I'm sharing it on social media... and you, my friend, need to start sending this stuff into Huffington Post! I'm so glad you chose to share this at the #SHINEbloghop Robin! It's one of my favourite posts! So freeing and such a great reminder! Thank you, Robin! Yes! Love this! We are our own harshest critics, but we are really just feeling normal things and all moms feel sometimes. This is beautiful - thank you for your honesty and your reminder to be gentle with ourselves. Wow! Very well said. Mom guilt is prevalent, and as a first time mother I feel it from time to time, and part of my guilt stems from thinking that I'm the only one that feels this way. Your words help tremendously, however. And from a novice mother, to an experience one: I really really appreciate your thoughts. Thank you so much, Maria. That means a lot. Sharing this- all moms need to read it. "I I actually love the 'idea' of it all. Just not in my house." Amen, sister. You always make me laugh! Hi Kim, thanks for your comment, and sorry to hear that you're struggling to feel comfortable in your own skin right now. Our bodies aren't quite our own during and after pregnancy! I wish you all the best, and I sincerely hope you find what makes you feel comfortable and beautiful! I know you should buy the same size pre-pregnancy but I am no longer the same size... fingers crossed the pants I ordered will be super comfortable.